NEW YORK -- With Scott Clemmensen unable to practice Tuesday morning at Madison Square Garden due to a lower-body injury that proved to be worse than originally thought, the Florida Panthers needed to find an emergency goaltender and didn't have much time to do so. 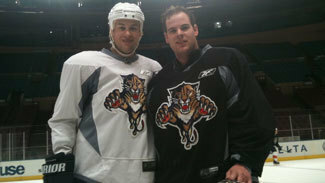 Luckily for the Panthers, Marty Reasoner knew of someone with goaltending experience working in the financial district -- his brother, Adam. "So I gave him a call and texted him. It was a pretty impressive turnaround. He was here in a half-hour." Adam Reasoner stepped onto the ice at MSG at 11:18 a.m., nearly 20 minutes after practice had begun. Coach Peter DeBoer said there would be no fine for Adam, but maybe his older brother would have to shell out the money to cover for him. The morning skate lasted another 30 minutes, plenty of time for Adam, 26, to get himself a workout and face some shots from Marty, 34. Adam works as a trader for a bond shop, but he was a goaltender with the Bay State Breakers of the Eastern Junior Hockey League for three seasons and played one game at Boston College as a freshman in 2005-06. In what Adam will likely consider one of the smartest things he's ever done, he's been keeping his goaltending equipment at a locker in his office. So when Marty gave him a call this morning, it was extremely easy to grab his pads and get a cab to midtown Manhattan. "When I got the text and the missed phone call, I knew something was up," Adam said. "My boss said it was slow on the trading floor and an opportunity of a lifetime. There'll be good stories on the floor after lunch." What did Adam tell the cab driver? "ASAP," he said. "I knew a couple shortcuts he wasn't taking, so he was getting smacked in the back of the head a little bit." How does an NHL practice compare to his normal Wednesday night pickup game at Chelsea Piers? "I'm about to have a heart attack," Adam said. Adam won't follow in the footsteps of Tom Fenton, a coach at Manhattanville College who received a call from the Phoenix Coyotes earlier this season when the team needed a backup goaltender for a game against the New York Rangers. The Panthers are calling up Tyler Plante from Rochester of the AHL for Tuesday's game against the Rangers. Adam won't see his name on the score sheet, but he received two things just about anybody would treasure -- a chance to participate in an NHL practice and a half-day at work. "It was fun. It was exciting to get him out here," Marty said. "I'm almost eight years older, so I never got a chance to play or skate together. This was a pretty cool experience." "I can't thank the Panthers enough," Adam said. "This was a real pleasure."